CE certified a Class B dive suit -- rated for water temperatures ranging from 10ºC to 18ºC. Made from X-Foam neoprene, the only "green" neoprene that complies with P.A.H. regulations. Ultraspan chest panel and Stretchtec side panels work together to produce a highly flexible and snug fit. Infrared (IR) fleece interior lining reflects body heat for extra thermal insulation and is extremely soft against the skin. 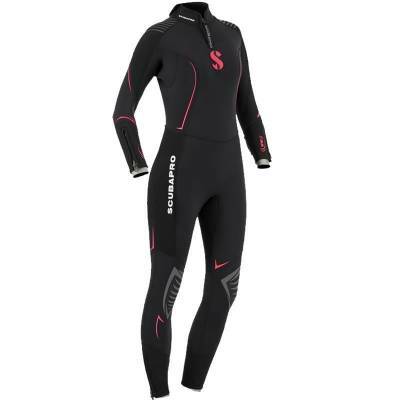 Zippered seals at wrists and ankles plus a rear diagonal zipper block water entry, are comfortable, make the suit easy to put on and take off. Abrasion resistant fabric on shoulders and seat along with elbow pads and kneepads increase long-term durability. Small neck zipper enhances topside comfort, eliminating the need to remove the suit between dives.